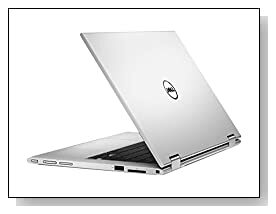 Dell Inspiron i3157 is the latest 2016 release 2-in-1 11.6 inch convertible touchscreen laptop that can be used in laptop and tablet modes as well as tent and stand modes around a 360 degree hinge, with a dual core Intel Celeron N3050 processor (2M cache) at 1.6GHz up to 2.16GHz speed with turbo boost, 2GB DDR3L SDRAM at 1600MHz for daily simple multitasking, 32GB eMMC flash storage for speed and snappy performance and the latest 64-bit Windows 10 operating system that you’ll see on most machines. 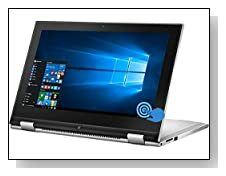 It has an 11.6 inch Truelife LED backlit high definition display with 1366 x 768 pixel resolution and IPS panel for up to 178 degree viewing angles. This is not a Full HD screen but at this small 11 inch size high definition resolution it still offers sharp and clear images and IPS is a good feature as you’ll need it when you’re using it in different modes or sharing screen. Integrated Intel HD graphics with shared memory with the main processor is good for daily multimedia, dual stereo speakers and MaxxAudio offer clear enough sound at this level. It doesn’t have a DVD drive being also such a compact machine and you don’t get the faster 802.11ac wireless on this model but the standard bgn wireless and is still fast with adequate coverage and has built-in Bluetooth 4.0 (2.4 GHz, 1x1), 2 x USB 3.0 ports, a USB 2.0 port, an HDMI output and 2-in1 Media Card Reader. It has a very smart and modern design, weighs 3.1 pounds and measures 11 x 7 x 0.7 inches- very compact, slim and portable, has a silver standard keyboard without the numpad but a decent touchpad for when you don’t want to use the touch function on screen. You can expect up to 6 hours of battery life from its 3-cell 43 WHr lithium ion battery so you don’t have to be near power outlets all the time when you’re out and about. It is nice to have two essential computing devices in one package- higher performance laptop with a full keyboard and a functional and convenient to have tablet that you have when you flip the keyboard around and put it on your lap. 2GB memory on a single slot is not a lot but should be fine for having a few browsers open at once. 360 degree hinge is great for performing different types of tasks, multitouch function on screen works well and you’ll like the vibrant colours and larger viewing angles on tablet and other modes. Convertible laptops cost more than normal but you need to think that you don’t have to pay extra for a tablet and you’re probably getting a proper power and performance of a laptop processor which also makes it responsive and fun to use as you won’t experience much freezing or lagging in your usual daily tasks like Word and Excel documents, running different software and casual gaming and Windows 10 starts up very fast in only a few seconds, also because of having a Flash drive rather than a regular mechanical drive.